The Braves really fucked up, you guys. During yesterday's home opener against the Mets, they set off a fireworks display way, way too close to the American flag. 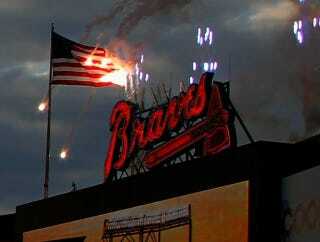 You are not supposed to put flames that close to the American flag, Braves! The photo above was captured by a fan who was at the game, who then went ahead and posted it on her Facebook page. It doesn't matter what the team does from here on out, this is the defining moment of the Braves' 2014 season.